Radio Detector Development by H. Winfield Secor, A.I.R.E. While wireless telegraphy is a far cry from the philosophy and traditions of the Hindus, it may not be inopportune to cite, for purposes of comparison, an ancient tradition of the Hindu priests which brings out in a marked and comprehensible manner the gigantic loss existing in wireless telegraphic transmission, with especial regard to the infinitesimal amount of energy that is received at the wireless receiving station with which to actuate the detector. Let us suppose that we have a marble cube 1 mile high x 1 mile wide and 1 mile long. Suppose, also, that a lady wearing a shawl visits this marble cube once in every hundred years (presumably not the same lady), and that she brushes the marble once with her shawl. 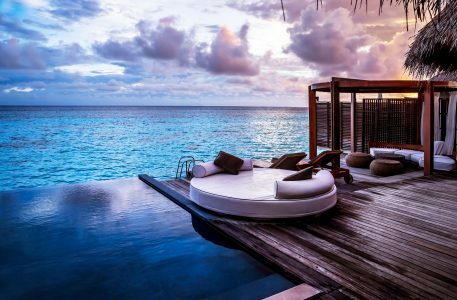 In time, of course, the marble will be worn down to the size of a pea, and he who can figure out the length of time in years required for this to be accomplished, would know the age of the earth. And the Hindus called this period of time one Marcalper, and the actual age of our planet as one Marcalper times one Marcalper. 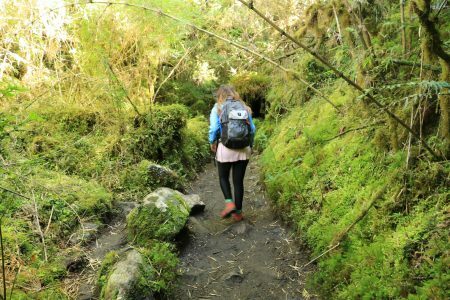 This is a homely little story which may help by comparison to instill in the lay mind something of the enormous loss of energy which takes place in the transmission of Radio signals over great distances. We will not deal exhaustively, or even attempt to, in the present discussion, on the efficiency of wireless transmission for any given condition or set of conditions, but an example of the amount of energy utilized at a typical trans-oceanic or trans-continental radio station and that arriving at the receiving station may be illuminating. We may easily assume that the amount of power radiated at a transmitting station for a 3,000 or 4,000 mile range is 50 K.W. or 50,000 watts. Bearing in mind that a watt is equal to 1 volt times 1 ampere, and that it is considered excellent when 20 micro-amperes or about .01 micro-watt is registered at the receiving station with which to actuate the detector, then we have some idea as to how all-important the radio detector is and we have an analogy to a degree, with the Hindoo philosophy cited above. With 50 K.W. used at the radio transmitter and but .01 microwatt received, we find that this is but one five-trillionth (l/5,000,000,000,000th) of the energy sent out. Before leaving this point it is well to mention that 10 micro-amperes (1 micro-ampere is equal to one one-mi1lionth of an ampere), is considered a weak signal and 20 micro-amperes received current a strong signal. 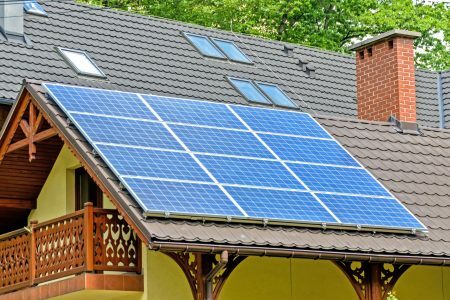 Technically speaking, radio detectors are usually rated by the amount of electrical energy in ergs necessary to actuate them. 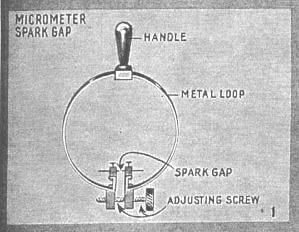 One of the first, and, so far as we know, really the first wireless detector which would manifest and interpret the electro-magnetic waves sent thru the ether by a spark discharge such as that from a static machine or induction coil, is the Hertz Micrometer Spark Gap or Resonator, shown at Fig. 1. This comprised simply an insulated handle on which was mounted a flexible metal loop and the abutting ends of which carried spark points or balls, which could be separated or brought very close together by a fine micrometer screw attachment as shown. 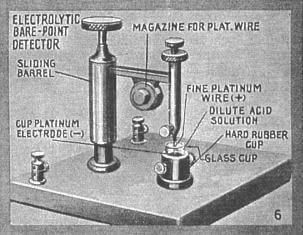 For short distances such as in laboratory tests over a few hundred feet, the spark gap resonator proved successful and showed Heinrich Hertz the way to his important deductions on which is based to a very large extent the wireless telegraph that we know today. The gap is regulated when in use until tiny sparks are seen to pass between the points every time the transmitting key is depressed. Next we come to the Filings Coherer as used by Guglielmo Marconi in the first commercial radio sets which he built and installed on a number of vessels. The coherer is shown at Fig. 2 with its magnetic taper, resembling a vibrating type electric bell, which, having its circuit closed by the relay connected with the coherer, served to shake the glass coherer tube and the metal filings within it and to de-cohere the filings or shake them apart. The coherer was then ready for the next signal. 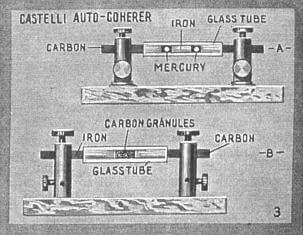 The metal filings of certain and exact proportions as found by lengthy experiments (after the method of Professor E. Branly of France) are placed within the evacuated glass tube as shown. This is carried on an ivory rod. Normally, and before the arrival of a wireless impulse from the transmitting station, the filings lie loosely in the tube and the resistance of the coherer is very high, causing the relay to remain neutral. When a wireless signal arrives, the current induced in the antenna passes thru the coherer to earth and causes the minute metal filings (usually a mixture of nickel and silver) to “cohere” or stick together. This has the effect of lowering the resistance of the coherer quite markedly and permits sufficient battery current to pass thru it and thus close the relay armature. 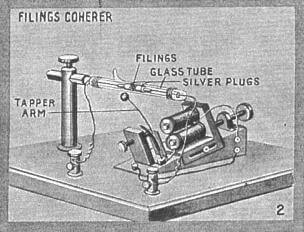 Simultaneously the de-coherer or taper circuit is closed and in the final radio receiving sets of this type developed by Marconi a Morse tape recorder was also connected in the circuit, upon which the incoming dots and dashes were recorded and the operator could then decipher them at leisure. Moreover, there was a permanent record of every message received in this case, which is often of paramount importance, especially in military and naval work. The coherer, however, had several defects in that it was not very sensitive and was difficult to adjust. It often lost its adjustment, in many instances, a minute or two after it had been regulated or set. Referring to Fig. 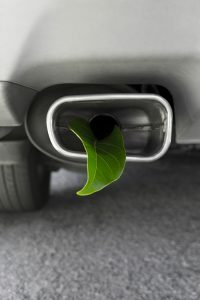 3, we have what is known as the Auto-Coherer. Several types of this detector have been evolved, but are practically extinct nowadays, owing to lack of sensitivity and other untoward features. One of the principal auto coherers developed was that known as the Castelli coherer and is said to have been used at one time by the Italian navy. It employed one or more globules of mercury within a glass tube, this globule (of 1.5 to 3 m.m. diameter) being placed between iron and (polished surface) carbon electrodes, preferably, as shown in the illustration. 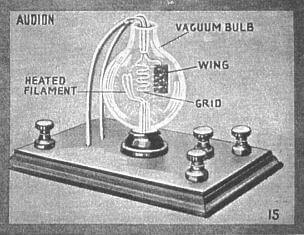 A modification of this arrangement, first used by Mr. H. Gernsback, involved the substitution of polished carbon granules between an iron and carbon electrode. These detectors were used with a telephone receiver and battery (one dry cell). They possess the faculty of establishing decoherence automatically, and thus are always ready to receive the next signal upon the cessation of the previous one. Their resistance falls upon receipt of a signal. 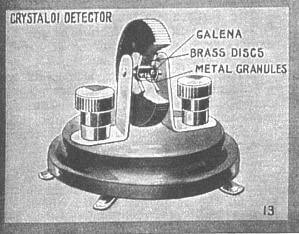 The detector illustrated at Fig. 4 is the well-known Rutherford-Marconi Magnetic Detector. This instrument operates on a very unique principle, viz., that of the reduction in any hysteresis effect occurring in an iron core, when this core is subjected to the effect of a Hertzian wave current passing thru the receiving circuit, according to the researches of C. Maurain. The complete detector is so arranged that a band of fine insulated iron wires constantly revolve about two rotary drums, driven by a spring or electric motor, and a pronounced hysteresis or magnetic frictional effect is produced in that section of the traveling iron wire band directly under the poles of a set of steel magnets mounted as shown. At this point there is also placed a small transformer containing a primary and secondary coil. Thru the primary coil is past the aerial current induced by the incoming electro-magnetic wave, while to the secondary coil is connected a pair of low resistance telephone receivers. It is evident, from the foregoing explanation, that at every incoming signal there will be a sound heard in the ‘phones as the Hertzian wave currents flowing around the primary coil cause partial cessations or reductions in the hysteresis effect produced in the moving iron wire band. 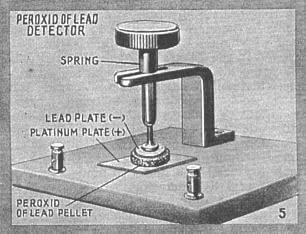 The Peroxid of Lead detector devised by S. G. Brown of England is illustrated at Fig. 5. This detector has proven quite successful and is used with a pair of sensitive telephone receivers and a critically adjusted battery current. 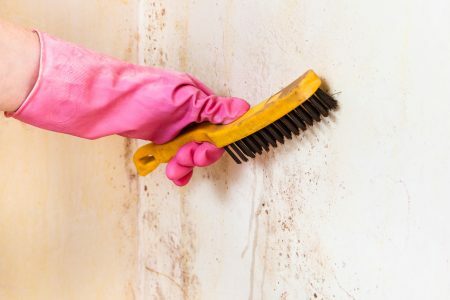 The instrument comprises a peroxid of lead pellet mounted between an upper lead disk and a lower platinum one; the pressure on the peroxid of lead pellet being adjustable by means of a thumb screw and spring in the usual fashion. This detector has been termed, more or less correctly, the dry electrolytic detector and its action is supposed to depend upon the fact that an incoming oscillation intensifies the counter-electromotive force set up by the cell (electro-chemical action due to lead-peroxid lead-platinum couple) and which opposes the applied battery current (1.5 volts about), thus causing the detector to increase its effective resistance. This results in a drop of current in the ‘phone circuit; as soon as the oscillation ceases the ‘phone current increases. The Bare-Point Electrolytic Detector illustrated at Fig. 6 has been the subject of much discussion among radio men as to who really was the basic inventor of it. But most writers of the day give credit, jointly, to Dr. Michael I. Pupin (1899), Professor Reginald A. Fessenden (1903) and W. Schloemilch (1903). The action of this detector is based upon the fact that if an extremely fine platinum wire, measuring a few ten-thousandths of an inch in diameter is allowed to partially immerse its extremity in an acid solution (such as one composed of five parts water and one part nitric acid) that an incoming Hertzian wave current will tend to arrest the strong polarization (the production of fine gas bubbles) set up about the fine platinum wire, which is usually made the anode in the battery circuit. Further, the electrolytic detector has been found by Professor G. W. Pierce to act as a rectifier and that the inherent action is also based on polarization capacity at the electrodes as first described by Pupin in 1899. Dr. L. W. Austin and others have found that the fine platinum wire may be positive or negative for feeble oscillations with equal results. The acid solution is contained in a glass or carbon or zinc cup as shown, and this acts as the cathode in the battery circuit. This detector possesses the function of acting as its own battery when a carbon or zinc cup is used, as this forms a miniature cell–carbon (or zinc) acid, platinum. This inherent battery action was intensified considerably by using a special amalgam in the acid solution in a detector of this class developed by H. Gernsback several years ago. The self-excited electrolytic detector has never been found (Pierce) to be as satisfactory as the externally excited one, for feeble oscillations. Another form of electrolytic detector which will stand considerable rough usage is that known as the Sealed-Point Electrolytic Detector. The commercial form of this instrument, as here illustrated, is known as the Radioson, Fig. 7. The operation is the same as in the bare-point electrolytic type of detector and a battery of two dry cells is used with it, together with a pair of high resistance telephone receivers and having the battery potential preferably regulated by means of a high resistance potentiometer. The advantage of this type of electrolytic detector is that the acid is sealed in, consequently does not spill or evaporate. 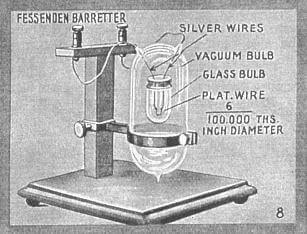 A detector of novel design and termed by Professor Fessenden, its inventor, a Barretter, is shown at Fig. 8. 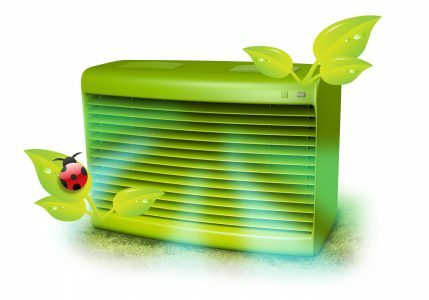 This works on the heat or thermal principle. An extremely fine platinum wire, about .003 inch in diameter, was first embedded in the middle of a silver wire having a diameter of about one-tenth inch. This compound wire was then drawn until the silver wire had a diameter of about .002 inch; as the platinum wire within it was reduced in the same ratio, it would be drawn down to a final diameter of .00006 inch. As shown in the illustration (Fig. 8), a short piece of this extremely fine platinum wire is supported on two heavier silver wires, and the leads are taken out thru the outer glass bulb for the purpose of connection in the radio receiving circuit. 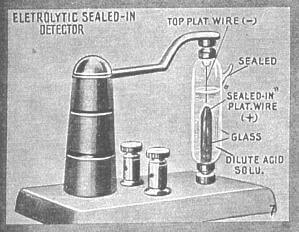 The tip of the fine platinum wire loop had previously to be immersed in acid to dissolve away the silver before the whole device was finally sealed up and the air exhausted from the containing bulb. When an oscillating electric current flows thru the extremely fine platinum wire loop, it becomes heated and rapidly increases its electrical resistance. A number of these Barretters were usually arranged in parallel and shunted by a telephone receiver joined in series with a source of current, such as a single dry cell. Hence, any variation of resistance of the barretter loops due to the heat produced by the Hertzian wave currents, would be manifested in the telephone receivers owing to the change in the amount of battery current past thru the circuit. 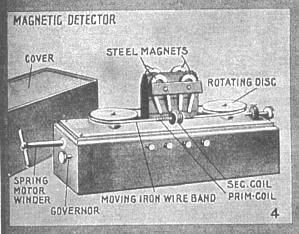 The Carborundum Detector, discovered by General H. H. C. Dunwoody, U.S.A., (Fig. 9) involves a marvelous characteristic possessed by a number of minerals, viz., that of rectifying an oscillating (alternating) current of practically any frequency. 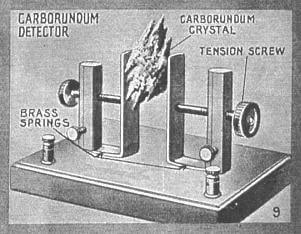 The carborundum detector in its usual form comprises two rather stiff springs, adjustable as to pressure, between which the carborundum (carbide of silicon) crystal (preferably an extremely jagged, greenish specimen) is placed. A pair of high resistance telephones are shunted across the detector and the incoming Hertzian wave oscillations, representing the dots and dashes of the telegraphic code, are manifested as short and long signals in the phones owing to the fact that the carborundum crystal will pass currents several hundred times better in one direction than it will in the reverse direction. This action is enhanced by mounting the crystal in a cup or clamp of large section, making the second electrode of very small contact area. A steel needle has been used effectually as the small electrode and in one commercial instrument the smaller electrode has been made of several steel needles in contact with the carborundum. Thus, the high frequency oscillations, or, rather, groups of oscillations, are rectified and the summation of each train of waves reacts on the ‘phones. 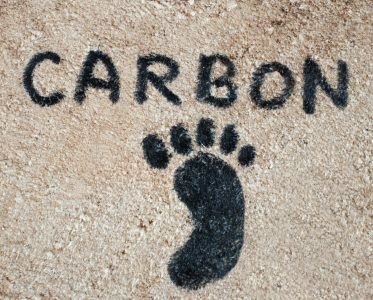 Battery current usually intensifies the action of the carborundum detector but its polarity must be watched, as also the potential applied. A potentiometer is best employed to regulate the current applied to the detector. 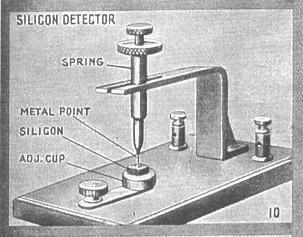 One of the best known radio detectors, and one that is now in extensive use, is the Silicon Detector. This is illustrated at Fig. 10 and employs a piece of the mineral Silicon embedded firmly in a brass cap. 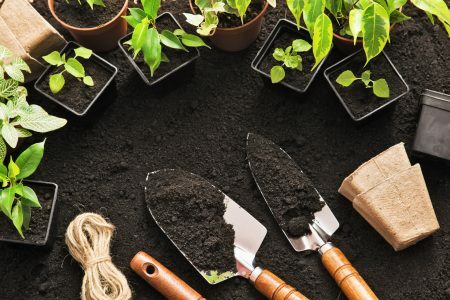 A solder or low heat alloy such as, Hugonium metal is best used in mounting such minerals, so as not to injure their radio detecting properties or sensitivity. The Silicon detector is generally used without any battery and acts as a rectifier, similarly to the carborundum detector. A pair of 2,000 ohm ‘phones or higher resistance ones, are shunted across the detector usually and owing to the rectifying action already described, the incoming Hertzian wave currents are manifested as short and long sounds in the ‘phones. At Fig. 11 we have the Perikon Detector developed by G. W. Pickard. This detector consists of two crystals–copper pyrites (Cu Fe S2) and zincite (zinc oxide ZnO), held in firm contact against each other in the manner shown. The copper pyrite crystal is mounted in a cup mounted on a spring-actuated rod provided with a suitable knob, by which it can be swung in any direction. Zincite crystals are mounted in a large cup containing several pockets, the mounting of both of the minerals being effected with a low fusing solder, Wood’s metal or Hugonium alloy. The action of the Perikon detector is supposed to be based on the rectifying principle previously described; that is, it will pass current in one direction but not in the other, and thus the incoming radio frequency oscillating (alternating) currents in the aerial are rectified and caused to give a sound in the high resistance ‘phones connected to the detector. This detector is invariably used with a battery of about two cells and the potential applied regulated by a potentiometer. When using a battery the polarity of the current must be such that the positive wire is connected to the copper pyrite crystal. 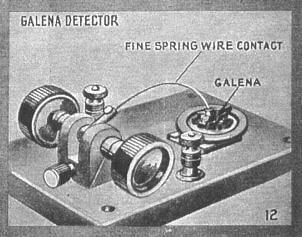 One of the most sensitive detectors, and one of the most popular with the radio amateur because of its extreme simplicity, is the Galena Detector, Fig. 12. In this instrument a piece of Galena (lead sulfide) is mounted in a brass cup by means of solder or other low fusing alloy and a light phosphor bronze wire called a catwhisker rests gently on the surface of the mineral. It is sometimes difficult to find sensitive specimens of Galena, but it is a matter of record and a proven fact, that when a really first-class specimen is obtained, it is practically second to no other detector, not even excepting the Audion. Messages have seen received with a Galena detector and simple equipment comprising a tuning coil, tin-foil and paper condenser and a single, high resistance telephone receiver over a distance of 2,500 miles, when the transmitting station was rated at only 5 K.W. The Galena detector is practically never used with a battery and acts on the rectifying principle possest by the minerals already discussed. The Crystaloi detector has two metal discs or plugs inserted in either side of the hard rubber revoluble drum, one of which contains a small piece of sensitive mineral. The space between the two metal disks is partially filled with a special mixture of certain light metallic filings. When adjusting this detector, the revoluble drum is moved a little at a time until the metal filings take up their proper position, making contact between the plain metal disk on one side and the sensitive mineral on the other. This action is quickly brought to a maximum by the application of the buzzer test current thru an inductance of several turns of’ wire. A pair of high resistance ‘phones should be used with this detector. Contrary to other mineral detectors, where only one “catwhisker” contact wire is used, the Crystaloi uses the many contacting points of the filings. The Fleming Valve Detector of Hertzian oscillations (Fig. 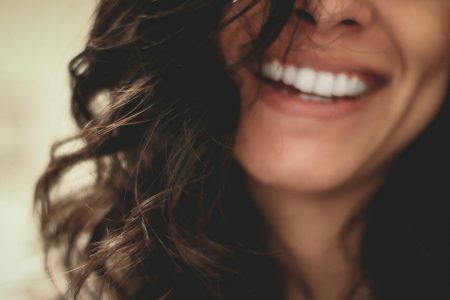 14) is based upon the principle that if we have a hot or incandescent electrode, and also a cold electrode, both mounted within an evacuated glass chamber, a rectifying action will be created, i.e., that negative electrical charges, such as those from a battery of 30 to 40 volts or even less, can pass from the hot filament to the cold electrode but not vice versa. 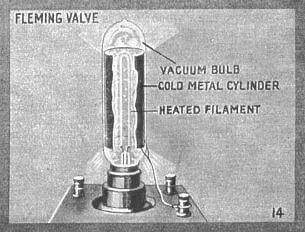 In the Fleming Valve, the cold electrode takes the form of a metal cylinder surrounding the incandescent filament. This arrangement acts as an electrical valve for oscillating or alternating currents of any frequency. The space between the cold cylinder and the hot filament is therefore said to possess unilateral conductivity. The Fleming Valve possesses a fairly high sensitivity; it is used with a pair of high resistance head ‘phones, a suitable battery and auxiliary regulating apparatus. 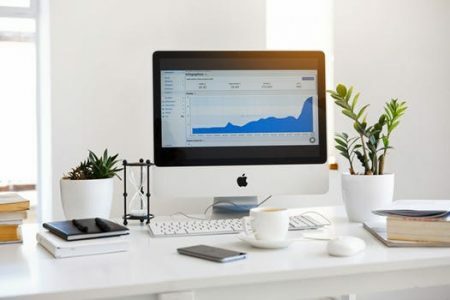 The wireless receiving phenomenon occurring will be evident from the foregoing and is in a sense of a rectifying nature similar to that possessed by the mineral detectors. The Audion Detector (Fig. 15) employs three distinct electrodes as shown, viz., a filament–a grid–and a wing or plate. The grid, composed of a wire member as indicated, is p laced between the filament and wing. The oscillations when they pass thru the Audion detector are subjected to a similar action to that occurring in the Fleming Valve; that is, they are rectified, but in so doing they are claimed to also effect a relay action with respect to a high voltage battery of 40 to 50 volts potential, connected to a pair of high resistance telephone receivers in the wing circuit. Thus, with the Audion it is seen that, owing to the suggested relay action inherent in its operation, it is quite possible and practical to have such an action occurring of considerable magnitude; that is, the ratio, between the amount of energy passing in to the Audion from the antenna circuit, and the amount of energy controlled by the relay or trigger action in the high voltage ‘phone circuit may be quite large. Several years ago, when the first radio transmission was being tried out between Honolulu and San Francisco by the Federal Telegraph Company, it was found that due to the extreme sensitivity and amplifying action of the Audion, the signals could be copied several hours longer each morning than with any other detector; the signals fading as dawn approached, owing to the supposed ionization of the upper atmospheric strata by the sun’s rays. There was, for a number of years, a great controversy on between the de Forest and the Marconi experts as to the validity of the Audion patents. This matter was discust in the November 1916, and also in the December 1916, issues of this journal and those interested had best read both of these excellent articles as well as a very exhaustive article explaining the action of the Audion which appeared in the August 1916, issue of THE ELECTRICAL EXPERIMENTER. One important early detector omitted from this review is the “imperfect contact”, which in one common form consisted of a carbon rod resting lightly on metal. 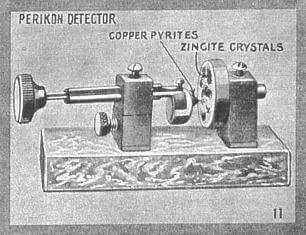 This was one of the first techniques that provided audio reception of signals, and was used from about 1900 to 1905, until being supplanted by more sensitive electrolytic and crystal detectors.